Brian Jones, (who tragically died just after his book about the history of ‘Pens’ was. Rofin-Baasel UK is celebrating its 20th Anniversary in 2016 with a strong track record of. On Friday 13th November, after a weather forecast of high winds and pouring rain, the. Birmingham based company Adapt Accountancy scored multiple wins in Wealth & Finance INTL’s 2015 Finance. Pictured with the Lord Mayor of Birmingham, Councillor Raymond Hassall, is Tim Prince. Tim formerly. Coffin Works 1st Birthday At the end of October The Coffin Works will be celebrating. IDM Media, a film production company based in the Jewellery Quarter, has been nominated for. Essential works to tie in the new stretch of Metro tram track with the existing. The Grade II Listed Standard Works in Vittoria Street which has stood empty for over. Cabinet Member for Health and Social Care, Cllr Paulette Hamilton, hopes Birmingham’s owl invasion can. On Sunday 19th July, around a hundred cyclists gathered for Birmingham’s 4th annual Big Vintage. community garden located on Soho Hill in Hockley will be given a new lease of. Elisabeth Johnson (Head of Operations at The Standard Works) tells The Hockley Flyer that that. Plans have been submitted to transform Warstone Lane and Key Hill cemeteries, both in the. A new cultural partnership between the British Library and the Library of Birmingham was been. This summer sees the Jewellery Quarter host another festival the first organised by the Jewellery. From June 2015 The Pen Room will be charging for admission: Adults Gift Aid Admission. A new set of temporary road measures supporting the Paradise redevelopment in Birmingham city centre. Nelson Primary School – Ofsted Rating Good to Outstanding! ‘Nelson Primary School would like to share their good news with the local community regarding. The structure of the new Assay Office Birmingham building has altered the skyline on Icknield. The following notice has been posted in the Key Hill passageway that connects Hylton Street. Review by Marie Haddleton I would not have known about this Guide but for the. 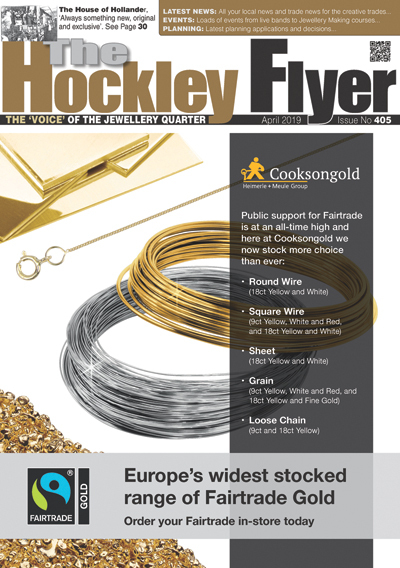 The Responsible Jewellery Council (RJC) announced recently that Assay Office Birmingham, the UK service industries. Have you ever thought how much impact a new floor could have on your home. Over £1 million is being invested to improve the sewer system that serves Newhall Court. This year, Assay Office Birmingham has chosen to send Christmas cards via e-mail, in line. WB The Creative Jewellery Group was delighted to support the National Society for the Protection. Assay Office Staff go Wild for Christmas Jumper Day! Assay Office Birmingham’s Christmas jumper day was well supported as staff turned out for work.